Trespa® TopLab Base, formally known as Athlon, is a flat composite panel made specifically for interior applications based on thermosetting phenolic resins, homogeneously reinforced with cellulose fibers and manufactured under high heat and pressure. Using special techniques, the panels have an integrated, decorative surface with melamine-impregnated paper. Designed for intensive use, the integrated decorative surface offers higher impact, scratch and wear-resistance. The ATHLON panels do not absorb or retain moisture, require no edge banding, have no subtop requirement and are not laminated to wood cores. Athlon can easily be cleaned using standard cleaning agents and/or strong disinfectants. 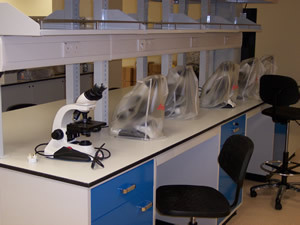 Trespa Athlon® offers an unrivalled performance in parts of laboratories where chemical resistance is not as critical. 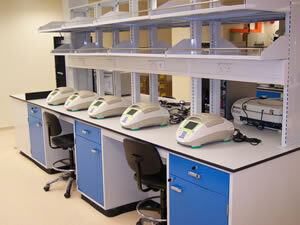 See Trespa Top Lab Plus for those specific applications. 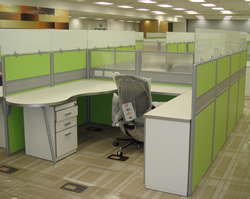 Athlon is extremely impact, scratch and wear resistant and not adversely affected by moisture. 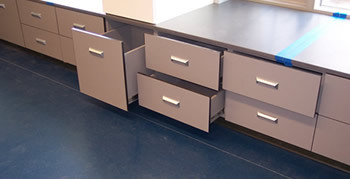 Perfect for casework and scientific furniture where requirements of low VOC's are demanded, non absorptive, will not delaminate and excellent cleanability. Trespa Athlon has a total recycled content of 15% post-industrial waste. Approximately 70% of the materials used to manufacture Athlon are derived from renewable sources. For thermo-recycling purposes, Trespa Athlon can be burned in industrial furnaces (at a temperature of greater than 1328 degree F) with no hazardous or corrosive gasses released. NEN-EN-ISO 9001 - Certificate of the Quality Management System issued by Lloyd's Register Quality Assurance. Trespa® Athlon® is a decorative high-pressure compact laminate (HPL) with a melamine surface, engineered for lasting good looks in the most demanding interior furniture applications. The underlying technology transforms wood-based fibers with thermosetting resins, under high pressure and at high temperatures, into robust panels that meet the most exacting specifications. With its special surface construction, Trespa Athlon® delivers excellent scratch resistance and overall durability. 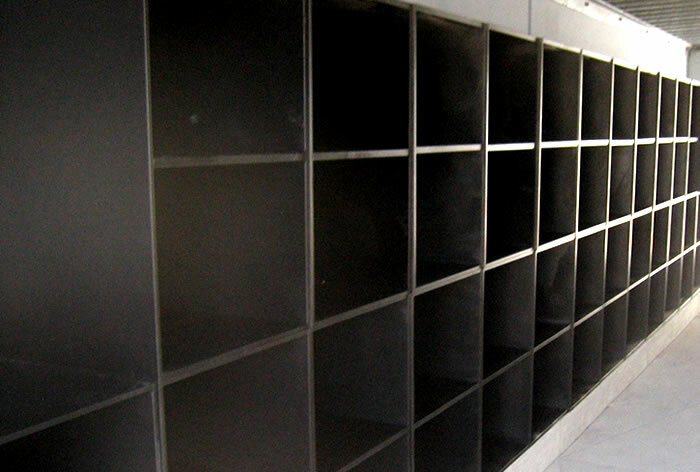 Even under heavy-duty conditions, the panels retain their appearance for an extended time. Trespa Athlon® is highly resistant to wear, making it ideal for installation where severe use and frequent cleaning are expected. Note: 1" (25 MM) is ONLY available in Black, White and Silver Grey surface two sides, with black edge core. 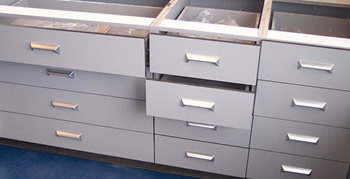 Surfacing: Standard finish - Crystal finish two sides. Other Colors not shown may have longer lead times. See brochure for Color Chart. Stocked items are Current inventory - Check with TLS prior to ordering. Material availability on a first come, first serve basis. 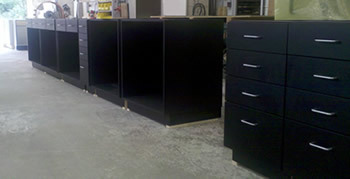 Only Firm and non-cancelable orders will hold existing stock for shipment. Impact resistance. The combination of a solid, homogenous core with a hard surface based on melamine resins gives Trespa Athlon exceptional impact resistance. This is confirmed by its excellent track record when used for wall cladding in public rooms, wanes coating and in other room applications susceptible to vandalism, bumper rails in hospital corridors, toilet partitions, lockers, etc. 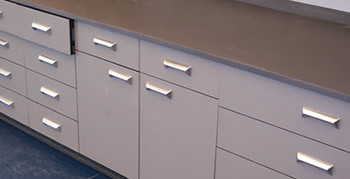 Tall casework as well as upper and lower floor cabinets are now being made of Trespa Athlon solid phenolic panels in place of Plam or plastic laminate furniture. 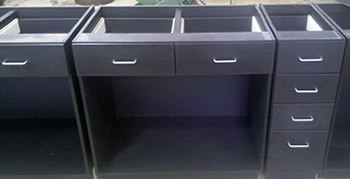 The cabinets are moisture resistant, abrasion resistant with no wood core, no edge banding or any possibility of delamination. Architects world wide are recognizing the importance of solid composite panels in lieu of plastic laminates and even steel cabinetry. Moisture resistant. Trespa Athlon is not affected by moisture or mold and will not rot. Both the surface and the core are made of thermosetting resins, which make them impervious to and not adversely affected by moisture and moisture absorption and are not susceptible to discoloration. High wear and abrasion Resistance. The special surface structure and durability of Trespa Athlon provide excellent scratch and abrasion resistance. 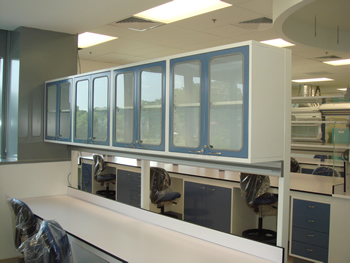 The panel retains its excellent properties over time, even after intensive use in heavy-duty applications. 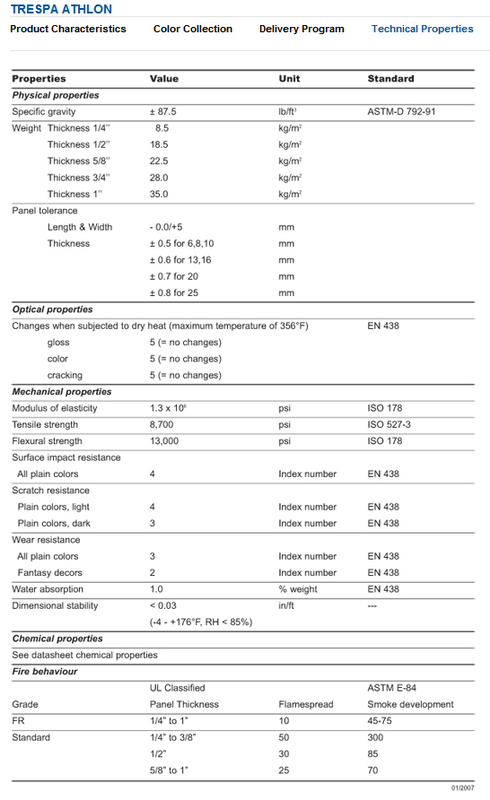 Tests in accordance with EN 438-2/91 verify that Trespa Athlon is highly wear resistant. Fire safety. Trespa Athlon is heat-resistant and meets the requirements of national and international fire standards for safe fire behavior. The panel material does not melt, drip or explode upon heating and retains its stability for a long period of time. 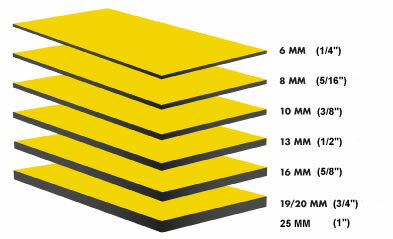 Trespa Athlon FR grade has a UL Class “A” fire rating in accordance with ASTM E-84. A Trespa Athlon panel will retain all of its characteristics in temperatures ranging from -40 to 266 degree F.
Chemical resistance. Trespa Athlon has a good resistance to organic solvents such as acetone, toluene, xylene and similar substances. 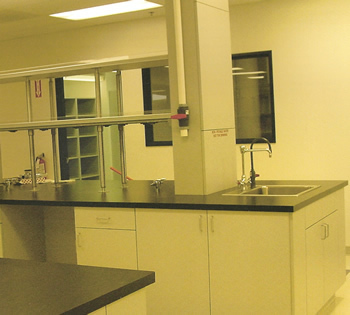 The panel is also resistant to disinfectants and detergents, food juices and dyes. These affect neither the properties nor the appearance of the panel. 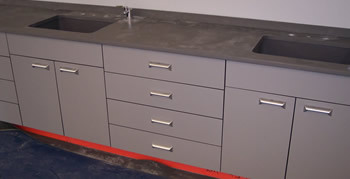 Normal maintenance and cleaning are recommended procedures to keep the countertop material. 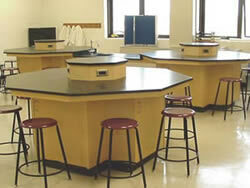 Should superior chemical and stain resistance be required, choose Trespa Top Lab Plus. Cleanability. The closed, non-porous surface of Trespa Athlon does not attract dirt. Trespa Athlon panels can be cleaned with either normal cleaning agents or with strong disinfectants, as the material is chemically resistant. The use of an organic solvent is possible without danger of affecting the color. Environmentally friendly. Very early in its life cycle, Trespa recognized the importance of an independent life cycle-analysis. Today Trespa can verify the ecological impact of its products - from the raw material and production process to the application and recycling. The dimensional stability and workability of Trespa Athlon are comparable to those of hardwood.